Watching the Center City Theatre Works production of “They’re Playing Our Song,” a musical, you wonder where the music is. Marvin Hamlisch and Carol Bayer Sager provided several memorably hummable tunes for the 1979 show that fictionally chronicles their personal lives and working relationship, yet the star of Jeffrey Lesser’s staging for CCTW is Neil Simon, the book writer. Lesser has his cast, Robert Smythe and Melissa Connell, play great attention to Simon’s script. His three-hour staging is more a romantic comedy with music than a musical about a quirky, probably mismatched romance. You not only get to hear Simon’s lines but see his structure and how he’s moving the plot forward. The pace works in contradictory ways. One the plus side, you have a fully realized play to go along with some good songs, most of them presented as an example of compositions Simon’s characters, Vernon Gersh and Sonia Wolsk, are writing for “Barbara,” which must actually be Barbra, and you have Connell’s upbeat yet emotional performance as the Sager stand-in, Sonia. Among the liabilities, you have a slow build that exposes the seams of the show, a long wait between what is an obvious song cue and the actual singing — I found myself watching keyboardist Michael Leggerie, II’s hands to see if he was poised to introduce a number. — and a loss of pep that belies the tone of the Hamlisch-Sager score, which veers between rhythmically driving numbers and ballads. Smythe’s Vernon falls somewhere in the middle. The actor finely etches Vernon’s character and is sharp with a retort and quick to romantic action but seems uncomfortable singing. Music always seems to be the victim in this production. Simon remains the star of the proceedings. Because of the pace, his lines don’t trip off the tongue naturally, but his ability to set up a series of one-liners, his way of approaching conflict, his incorporation of running gags and character traits, and his obsession with characters consulting doctors are crystal clear. “They’re Playing Our Song” becomes a seminar of sorts in dissecting the skill of Neil Simon. Everything the playwright does is there to examine plainly. The careful, deliberate staging kept me interested, but I could see how it could tire many in the audience who are not inclined to be as scholarly about dramatic structure that includes musical interludes. Even I became impatient for songs to begin. CCTW’s “They’re Playing Our Song” cries out for more music. I am aware that the second act only offers three tunes, but I found myself at times thinking, “They’re never going to get the song. I’ll have to be playing their song in my head.” The sequence before Sonia records my particular favorite among the numbers, “I Still Believe in Love,” felt as if Smythe and Connell had to wade through an hour’s worth of dialogue when the song is the important element, and the situation involves a pressing deadline made more Damoclesian by Sonia’s chronic lateness. An amiable production with two likeable leads and two agile trios of alter egos representing the various shades of the principals’ personalities gets bogged down in its story. The dynamics of Vernon and Sonia’s relationship supersedes the punch Hamlisch and Sager’s songs provide, so CCTW’s “They’re Playing Our Song” can be slow-going and keep you anticipating a musical passage that might take longer than usual to arrive. The production has many merits in spite of its leisurely unfolding. One is you see Vernon and Sonia so closely, you grow to like both and want their romance to get past its hiccups and flourish. Doing “They’re Playing Our Song” as a play makes the characters less superficial, less vessels heading towards the next song, than in most productions. Another asset is Connell’s ability is let to see you everything in Sonia that irritates Vernon and that would try the tolerance of any man, whether lover or collaborator, while conveying Sonia’s vulnerability and innate goodness. Third is when a scene finally gets around to its musical payoff, the numbers work and have their impact in spite of oddities in both Smythe’s and Connell’s voices. Taking everything into account, including some elements that don’t arise in many productions, Lesser’s “They’re Playing Our Song” is satisfying if you’re willing to have Neil Simon’s contribution outweigh the composers’ and if you accept that a sweet play about a relationship is going to unfold, as opposed to a breezy musical whooshing by. Lesser definitely puts his emphasis on Vernon and Sonia being a romantic couple in embryo instead of them being songwriters who need to learn to work in harmony (pun intentional; you can groan now). While both Smythe and Connell act their parts well, Smythe showing the nuances of Vernon’s character while Connell paints with a broader brush, both of them startle you a bit when they sing. Smythe has no voice at all, which surprises me because I swear I remember him singing well once upon a time. When he sings the first song in the show, “Falling,” you might think the quiet, off-tone, half talking approach Smythe takes is his ways of playing how a composer, a writer rather than a performer, sings. You can chalk it up to a character choice. Later, when a number is a more spontaneous part of the plot, as with “If She Really Knew Me” and the title song, you see the struggle to create melody is a trait of Smythe’s actual voice. To the actor’s credit, he conveys the meaning in his songs, but his inability to croon or belt creates some inadvertent tension. The audience feels concern for Smythe as an actor, especially because Smythe does not look too happy when Leggerie starts a song’s intro. Ironically, the song he does best is Vernon’s eleven o’clock number, “Fill in the Words,” played creatively on toy piano while Smythe intones the simple tune sweetly and with feeling. Connell’s vocal quirk is more peculiar. She speaks in a clear, pure tone that is pleasant and right for Sonia. When she sings, she suddenly affects a rock voice that has black inflections — Connell is not black. — and seems out of kilter with the words, sentiment, and correct delivery for a Hamlisch-Sager tune, particularly if you consider Connell sings several songs to demonstrate what Sonia and Vernon have written. The effect is actually a bit stunning, as in shocking, not pleasantly surprising. If Connell sings the word “time,” it comes out “tom.” If she sings the word “love,” it turns into Cher’s “luv,” “R’s” completely disappear, and not just at the end of words, which is a singer’s trick. Instead of Sonia, Connell becomes a jazz stylist in an R&B club. Her presentation doesn’t suit the occasion. I already worry about the substitution of rock voices for legit voices in the theater. I often want to slap or dismiss “American Idol” contestants who alter melodies or indulge in melisma and other embellishments. Connell’s renditions of “Workin’ It Out” and “Just for Tonight” were just as off-putting. She stuck to the melodies and sang the tunes as written, but she compromised the purity of her voice to show off a vocal gimmick that doesn’t work for show music. Not even in “Dreamgirls” or “Purlie!” The most irritating part is I think Connell can sing well and prettily without resorting to affects that mitigate her performance. In a club, she can suit herself and retain the obviously studied black inflection. In a show like “They’re Playing Our Song,” it became a curiosity, a distraction instead of the artistic touch I’m guessing Connell designed it to be. Everything does not go when you’re playing a character. Connell has to reconsider her vocal style if she wants to do standard, American Songbook musicals. The singers that stood were the three men and three women who play the various sides of Vernon and Sonia’s psyches. They pop into to give numbers extra liveliness and extra harmony. Of the six performers, Brandon Weber, who has a clear, perfectly pitched tone, made the biggest impression. Tyler Houchins, Frank Schierloh, Neena Boyle, Adair Arciero, and Alexandra Sices also did a fine and refreshing job with their vocals and their ability to efficiently move furniture. For all their eccentricities, Smythe and Connell make the most out of Hamlisch’s wonderful title number in which Vernon and Sonia show their writer’s pride by not only reacting to but getting up to dance to their first hit records coming over a restaurant sound system. I also liked the intimacy of “When You’re In My Arms.” For some reason when Smythe and Connell sang in duet, their vocal oddities disappeared. 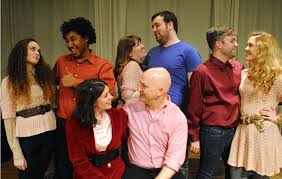 “They’re Playing Our Song” runs through Saturday, April 26 as produced by Center City Theatre Works at the Skybox of the Adrienne, 2030 Sansom Street, in Philadelphia. Showtimes are 7:30 p.m. Wednesday through Saturday and 2 p.m. Saturday. 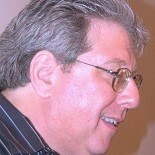 Tickets range from $24 to $16 and can be obtained by calling 215-732-3797 or going online to www.centercitytheatreworks.org. This entry was posted on April 23, 2014 by nzoren in Theater Reviews and tagged Adair Arciero, Adrienne Skybox, Alexandra Sices, Brandon Weber, Carol Bayer Sager, Center City Theatre Works, Frank Schierloh, Harry Schonleber, Jeffrey Lesser, Marvin Hamlisch, Melissa Connell, Michael Leggerie II, musical, Neena Boyle, Neil Simon, Robert Smythe, Romantic Comedy, They're Playing Our Song, Tyler Houchins.